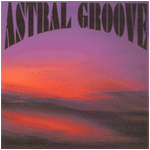 Astral Groove was recorded in 1995 after Lars Eric Mattsson having played for about a year in a cover band doing Jimi Hendrix and Blues classics, so it is no big surprise that this release is pretty heavy on the blues vibe. Usually described as Hard Rock with funk and blues influences Astral Groove is a bit different from other albums that Lars had been involved in. It was by accident that this project ever came true. Lars had been writing the material with the plan that the musicians in his 1994-95 cover band, Voodoo Chile would record the songs, but it just did not work, so in stepped vocalist Bjorn Lodin, coming from his own band Baltimoore, which had just released it's 4th album and also split up. Bass player Michael Ahlskog had previously played in VISION as well as on Lars' earlier solo recordings. Drummer Thomas Tornefjell made the band complete. Several reasons, both personal and commercial, killed the band which never got a chance to perform live. But the music lives on - and you can't deny that ASTRAL GROOVE was jam packed with great feel!